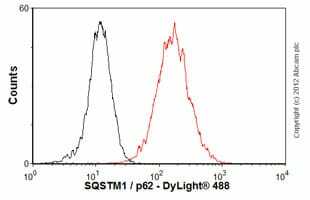 Recombinant full length protein corresponding to Human SQSTM1/ p62 aa 1-440. Our Abpromise guarantee covers the use of ab56416 in the following tested applications. ICC/IF Use a concentration of 10 µg/ml. Fix cells for 15 minutes with 2 mL of 4% paraformaldehyde solution (pH 7.4 with NaOH in PBS). Permeabilize cells by incubating for 15 minutes on ice with 2 mL of 0.1% Triton X-100 in PBS. 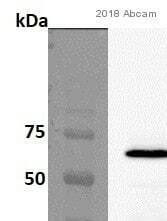 Western blot - Anti-SQSTM1 / p62 antibody (ab56416)This image is courtesy of an Abreview submitted by Melanie Thelen. Blocked with 5% milk for 3 hours at 21°C. Incubated with the primary antibody for 17 hours at 4°C. Monoclonal antibody to SQSTM1 (ab56416) on HeLa cell, antibody concentration 10 ug/ml. ab56416 staining SQSTM1/p62 in Human A431 epidermoid cancer cells by ICC/IF (Immunocytochemistry/immunoflurescence). Cells were fixed with formaldehyde, permeabilized with Triton X-100 and blocked with 5% BSA for 30 minutes at room temperature. Samples were incubated with primary antibody (1/50) in 5% BSA for 1 hour. 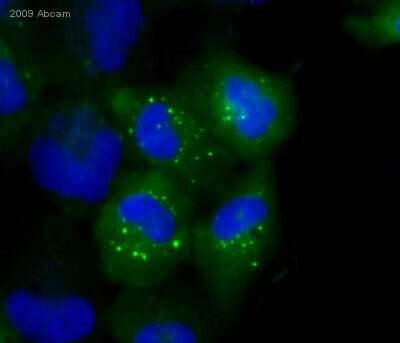 An Alexa Fluor® 488-conjugated Goat monoclonal to mouse IgG (1/50) was used as secondary antibody. Overlay histogram showing HeLa cells stained with ab56416 (red line). The cells were fixed with 80% methanol (5 min) and then permeabilized with 0.1% PBS-Tween for 20 min. 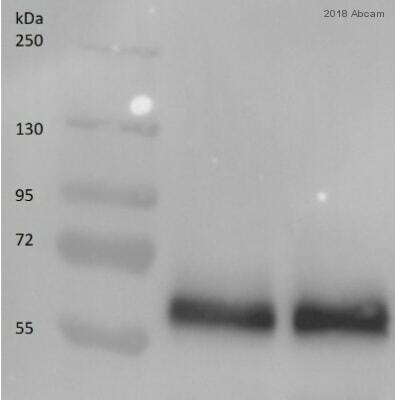 The cells were then incubated in 1x PBS / 10% normal goat serum / 0.3M glycine to block non-specific protein-protein interactions followed by the antibody (ab56416, 0.5µg/1x106 cells) for 30 min at 22ºC. The secondary antibody used was Goat Anti-Mouse IgG H&L (DyLight® 488) preadsorbed (ab96879) at 1/500 dilution for 30 min at 22ºC. Isotype control antibody (black line) was mouse IgG2a [ICIGG2A] (ab91361, 1µg/1x106 cells) used under the same conditions. Acquisition of >5,000 events was performed. 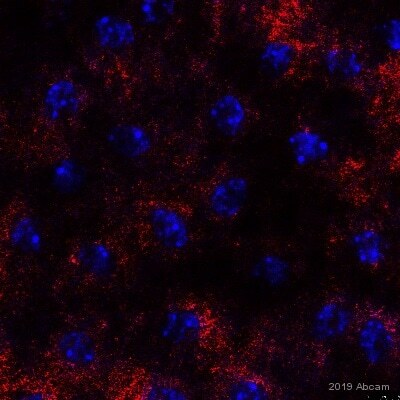 ab56416 (1µg/ml) staining SQSTM1 in human lymph node using an automated system (DAKO Autostainer Plus). Using this protocol there is strong nuclear and cytoplasmic staining. Sections were rehydrated and antigen retrieved with the Dako 3 in 1 AR buffer citrate pH 6.0 in a DAKO PT link. Slides were peroxidase blocked in 3% H2O2 in methanol for 10 mins. They were then blocked with Dako Protein block for 10 minutes (containing casein 0.25% in PBS) then incubated with primary antibody for 20 min and detected with Dako Envision Flex amplification kit for 30 minutes. Colorimetric detection was completed with Diaminobenzidine for 5 minutes. Slides were counterstained with Haematoxylin and coverslipped under DePeX. Please note that, for manual staining, optimization of primary antibody concentration and incubation time is recommended. Signal amplification may be required. 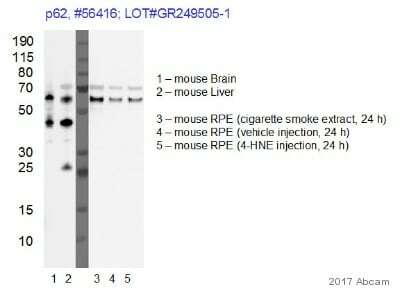 Western blot - Anti-SQSTM1 / p62 antibody (ab56416)Image courtesy of Dr Randal Tibbetts by Abreview. Observed band size: 62 kDa why is the actual band size different from the predicted? 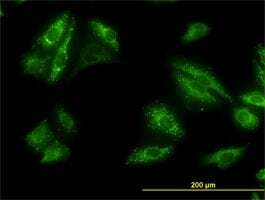 All lanes are whole cell lysate prepared from HeLa cells. Treatments are listed. 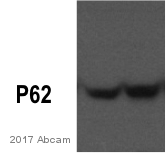 Western blot - Anti-SQSTM1 / p62 antibody (ab56416)Image from Vazquez-Martin A et al, PLoS One. 2009 Jul 16;4(7):e6251, Fig 4. Lane 1 : Whole cell lysates prepared from Tzb-naive SKBR3 parental cells. Lane 2 : Whole cell lysates prepared from Tzb-refractory TzbR POOL1 cells. Lane 3 : Whole cell lysates prepared from Tzb-refractory TzbR POOL2 cells. Publishing research using ab56416? Please let us know so that we can cite the reference in this datasheet.